The Oklahoman editorial writers have become obsessed with deriding and mocking the Occupy OKC protests and the entire Occupy Wall Street movement, which means we know the local demonstrators have accomplished something positive here. Two editorials this week that were published on NewsOK.com collectively refer to the local protesters as “clowns” and their downtown camp site in Kerr Park as one of the OWS’s “Porta-Potty embattlements.” But the mocking only highlights the fact that the local oligarchy here, or what the OWS movement calls the “1 percent,” is worried about major structural change in our economic system that now privileges the wealthy at the expense of 99 percent of Americans. 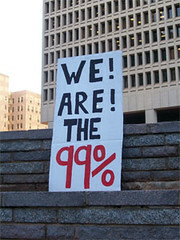 The movement reminds us that the growing wealth disparity in this country is not sustainable. The two editorials published so far this week-and there will probably be more-follow several editorials published over the last several weeks that sarcastically denigrate the occupiers but absolutely fail to address the issue of economic injustice that has been the central theme in OWS protests throughout the country. In an editorial (“Many goals of Occupy campers have been accomplished,” Nov. 29, 2011) published Tuesday, the newspaper makes the inane argument that the election of President Barack Obama and “Democratic Congresses” have made the movement fait accompli. In other words, why should anyone protest since, well, to use just one of the newspaper’s strange examples, the government recently stopped a merger between two large corporations? The absurdity of this tortuous argument cannot be overstated nor the obvious fact that the newspaper’s editorial writers are simply baffled by the OWS movement and its meaning. The editorial also contained the “Porta-Potty embattlements” reference as if the protesters should be laughed because they go to the bathroom in portable facilities. It simply makes no sense. Truth is, the city never had to allow these clowns to stay even one night in Kerr Park, but did so in a spirit of cooperation – for two months. For that it has gotten only derision in return. Enough is enough. Truth is, Kerr Park is public property. Truth is, the First Amendment to the U.S. Constitution sanctions “the right of the people peaceably to assemble . . .” Truth is, The Oklahoman should be a champion of the First Amendment, which also guarantees freedom of the press, but it apparently isn’t. This is what The Oklahoman is saying: “Enough already” with this First Amendment stuff. What The Oklahoman and the oligarchy it supports are worried about is that OWS demonstrators, in the face of potential police brutality, are risking injury and major discomfort in getting arrested as they stand up for, among other things, economic justice, decent jobs and a chance to go to college without ruinous debt. American history is filled with successful protest movements in which people “occupied” or took over space and then were demonized by the establishment and arrested. Some past protesters were beaten; some were killed in their cause. Today, police overreact with pepper spray or other forms of modern brutality. It may work for a moment, but it never works in the long-term, and those who sanction, allow or remain silent about brutality always end up on the wrong side of history. Occupy OKC has been asked by the city to stop using Kerr Park as a camping spot, and it remains to be seen if arrests will be made and how the local police will handle the issue. Throughout the country, cities have been arresting protesters in what can only be described as a concerted effort by the American oligarchy and its authoritarian sycophants to stop the movement, but it’s not going away anytime soon here or elsewhere. Can you imagine what the streets will be like next spring and summer in an election year?